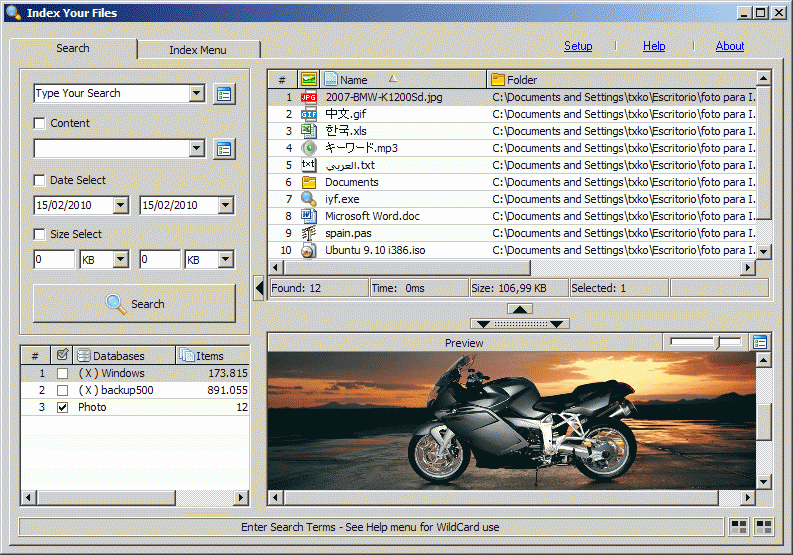 Index Your Files allows you to search through all your files or folders on local or networked drives. Searching can be done by name, date, size, location etc., and boolean operators are available to to perform multiple keyword searches. You can invoke Windows Explorer context menus on found files to perform operations such as drag/drop, copy, rename, delete etc. It also includes internal viewers for text, HTML and image files. Fixed - Small text (tntpnl38) in the search panel (Windows 7). Note: Working an a major update with many improvements. I liked the program and am trying to use it for indexing a network drive. I'm indexing through a DSL connection that occasionally drops. The index takes about 10 hours for 1.5 million files and the drive size looks on the order of 2.5 TB. When it drops the connection during this time - is there any way to recover and go on from where the drop occurred? For a scheduled index - is this incremental or does it start over from no indexing? link is dead-site is dead,freeware files has this version for download on there mirror. Please help: New to version 4.0 alpha 16 as the Czech box and display the data. We have many changes in the new version can not use this version. The tick needs to be locked up and select a few options that are specific. Showing below up space and threads and use the new version have been completely unusable. You 're always good friends with your vast. Do you: Like the new version 4.0 alpha 16 in the check box and display the data. We have many changes in the new version can not use this version. The tick needs to be locked up and select a few options that are specific. Showing below up space and threads and use the new version have been completely unusable. @Rafael Castro, Is it possible in the future to track changes to files and update the database in real time?.. use ReadDirectoryChangesW? For example: A computer can index the entire network and create databases, other computers may use that database. add a copy, move, delete files with progress bar, questions about overwrite, skip, continue, etc. all the ideas you have, you can send them by mail. Rafael, could you give an idea about the new planned features you wrote about in your website? guys, one click on splitter, hide preview. rd: simply hold the preview pane from the part where there is a splitter between search results and review and hide it. RC: if you are Rafael Castro, then kudos for a magnificent piece of work! Now if you could only add an option to set a filter on what to index (extensions) and what not, that would make my life easier. RC... was that an answer to how to disable preview? Please tell me in english how to disable preview. Where is the box that says "DISABLE PREVIEW"? If IYF is hidden, how do I browse my files? I just want to disable the preview. Shouldn't be this difficult. Can't close the preview window... nothing in setup regarding disabling it. For the love of God... I hate the preview window... i just want to delete files, not watch a freaking movie every time I click on a file. Please enlighten me. When hidden the preview (with splitter) IYF not load files in the preview. It is easier to work with the files found. How do you "disable preview" ? Also, it seems to launch many files just when you select them (as opposed to double clicking them), very annoying. I just downloaded it. It is 5.0.2.5, now. IYF Revolution no longer exists. Much improved interface and reasonably fast and still easy to use. Indexed about 285,000 files in about 9 minutes. I like that it will index network drives, USB, local drives, etc. Wish list (1) regex searches (2) ability to search in a results list. David and John Smith, the Open folder icon at the bottom of the Search screen shows selected files in Explorer windows. It will open up multiple windows if the files you select are in different folders. (with both commas) Then you can right click on file or folder and send it to the explorer. It would be wonderful to have a "show in explorer" option for items that the search returns. Any chance of this? Thanks for the great program! I love the program and am loving it even more now that it's been updated, it's been a godsend! The only feature I'm hoping for is the ability to search exact phrases. Quite recommended, the application is small, looks nice and finds file in a breeze. If I would be asked to improve something I would change the GUI so that only the relevant data could be seen i.e. like the FFox sidebar that can be hidden, but altogether I give it a strong thumbs up and will keep it for use on my USBHD . I would like to know if there will be futures updates. Also how to translate it. I NEED A SAMPLE OF AN ALREADY INDEXED FILES. In the page Web the email is. It would be nice if the website itself had a link for submitting suggestions, etc but it seems here is the only place to do it. Why is there no option to sort the database lists into alphabetical (or other) order? Is there any way this can be done? Improved. If you move a group of files it doesn't automatically update the index. I thought it hadn't moved about 150 files after I came up with the same files at the same location on a second search. So, I tried to move again. (It's a good thing I had AutoIt to write a script because it would have been annoying to have had to hit the OK key 150 times when it told me the files couldn't be found.. :) There was no way to break out of that error loop gracefully. Some more on screen activity showing the moves would be helpful. Would like to see the ability to checkbox multiple directory's to index when browsing instead of having to pick one at a time. The search inside feature is about average as far as speed goes but since it doesn't index the contents of files that's to be expected. It highlights the first instance in the preview screen but I couldn't find a way to go to the next incidence. I'm a fan of indexing stuff and this is much improved over prior versions. Good work. FYI, Doesn't support running from or indexing UTF named directories. Sorry Rafael forgot to change name to De. Cheers for that Rafael. All good now. Have also discovered that it would be nice to have an option to exclude subfolders from indexes. And even just selected subfolders. Eg I want to scan my Documents folder but don't want the Music, Pictures and Video folders included because they are indexes of their own. I would like to be able to include other Documents subfolders though. The preview blocks it, Deactivate the preview, delete, and active preview. I think this program is great but what is the point of having a Delete function when a file can't be deleted because "it is being used by another person or program". Yip, and that program is Index Your Files. For a file name search tool it's great. Too limited of a tool for me if it can't search within files. It's not in the league of Copernic, X1, etc. but I guess it's not trying to be. I like the speed and small size. Works great. I think I will buy the one that works directly from CD. I like the speed of the built-in viewers. Searching "within" files is a feature of their commercial product Index Your Files - Revolution.